In today’s credit environment, student loan lenders have been exiting the practice of student loans in droves. You can’t blame them, the percentage of borrowers who defaulted on their federal students loans within two years of repayment has increased again, from 9.1% to 10%. The Chronicle of Higher Education notes that over 200 schools had default rates of 30% or higher. As college costs continue to spike higher and the job market absorbs fewer and fewer new graduates, default rates won’t be dropping anytime soon. The federal government offers the Direct Consolidation Loan to combine your existing federal education loans into one payment. The main advantage they tout is the ability to make one monthly payment instead of making payments to potentially several different lenders. This doesn’t seem like much of an advantage to me, as I have no trouble staying organized and paying the various lenders on time. Also, Sallie Mae combines my federal loans into one grouping already, and I’m making one payment to them anyways. The interest rate for Federal Consolidation Loans is the weighted average interest rate of all loans considered, rounded up to the next nearest higher one eight of one percent. In essence, they are increasing the total payment under the guise of providing an actual service to the loan holder. Another disadvantage to this option is losing the ability to fully pay off your highest interest rate loans if you come into some money. In my opinion, this option provides no advantages. 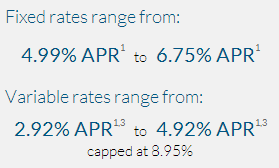 Variable rates offered were from 3.75% (for high earners/credit scorers) to 8.75% (for higher credit risks). Fixed rates varied from 7.24% to 12.29%. Since I was looking specifically for fixed rate loans, and most of my loans sat around the 7.5% range, Wells Fargo was not saving me any money at all. The high consolidation interest rates were starting to weigh on me. The LIBOR was so low, but Wells Fargo is protected themselves against a rising rate of default. My rate is higher than it could be because of the high average risk and the fact that there is no collateral on student loans. I made a mistake and was certain to pay the price. Consolidating with Well Fargo or CuGrad would provide no additional savings for me and my fellow legion of graduate students. This chart immediately opened my eyes, because even the highest interest rate offered by SoFi is lower than the lowest interest rate offered by Wells Fargo or any of the other consolidators. I applied, got an interest rate in between 4.99% and 6.75%, and executed the consolidation. Everything went smoothly, and I am now the proud owner of a loan for the same total amount, but with a shorter payoff time frame and lower interest rate. I had finally won. The benefits were just too great: (1) I had the opportunity to consolidate private and public loans into one monthly payment, (2) I locked in a rate below every loan I held, and (3) I feel like I’ll get assistance in finding another job instead of incessant calls from the lender if something happens with my current position. In other words, check it out. If you found my article helpful and you would like to receive $100 if your loans get fully funded, use this link to fill out your application. I know, it’s basically just enough to take your sweetie out on a nice date, but hey, when was the last time dear old Aunt Sallie Mae left enough money in your checking account for a steak dinner?